Former Chicago mayoral candidate Gery Chico’s appointment as chairman of the state Board of Education hit a snag Wednesday amid GOP questions over his ties to a now-defunct non-profit organization. Based on issues raised by a Texas blogger, Senate Republicans put the brakes on Quinn’s appointment, asking that Chico personally appear before a Senate panel to explain his relationship with Save A Life Foundation, a charity that is undergoing a probe within Attorney General Lisa Madigan’s office. According to the senate website, Mr. Chico is appearing before your committee tomorrow morning. This is to request that today you review and share this information with your fellow committee members. Do you think the Chicago Public Schools Inspector General should investigate whether $62,000 paid by the schools to the Save-A-Life Foundation (SALF) was properly administered? ..."It's free to the children. We bring this course to schools for free," Spizzirri said. But it wasn't free to the Chicago Public Schools, where officials say Save-A-Life charged them $50,000 the past two years. (Carol) Spizzirri launched a nonprofit organization dedicated to teaching children emergency response techniques, raising at least $8.6 million in federal and state grants for her Save-A-Life Foundation. Firefighters and paramedics were recruited to offer instruction on how to apply CPR and stop bleeding and choking, said Spizzirri, who estimates 2 million children took the classes, many of them from the Chicago Public Schools. As any parent knows, every school activity generates paperwork. An extracurricular program of this nature using outside employees (firefighters and paramedics) would undoubtedly produce mountains of documents: student and teacher schedules, training materials, employee records, evaluations, and much more. But in response to a federal court subpoena (filed by my attorney in Save-A-Life Foundation v. Baratz) and public records requests, the Chicago Public Schools (CPS) have failed to produce records for any training classes. 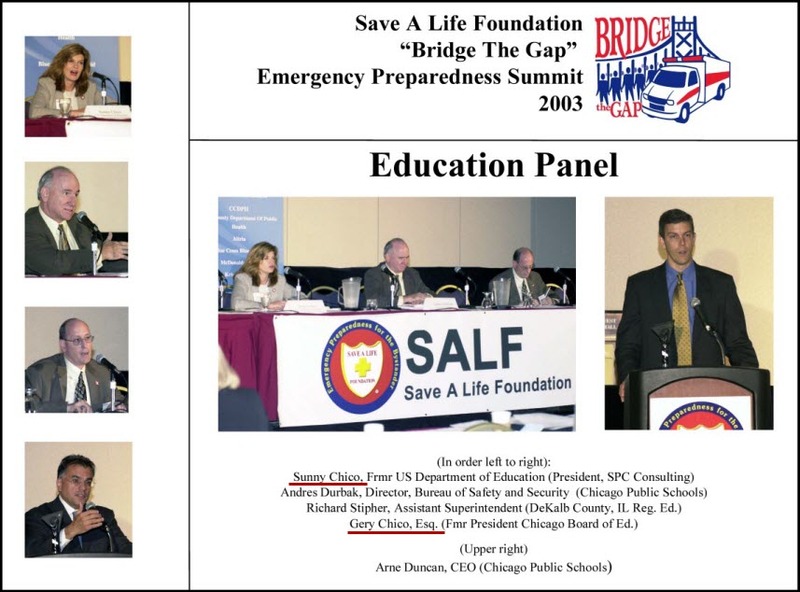 Per the above information and the documentation below my signature, Mr. Chico (and his wife) were associated with and promoted SALF both during and after his years on the Chicago School Board. In my opinion, it should be him, not me, asking IG Sullivan to investigate SALF. If he's unwilling to assume that minimal degree of responsibility, it's unclear why your committee would entrust him to head the State Board of Education. Finally, records indicate members of your committee were associated with SALF. I'm unfamiliar with your protocol, but it may be appropriate to disclose the details at tomorrow's hearing. Thanks for your time and consideration. If you have any questions or would like additional supporting documentation, please don't hesitate to contact me. (1:00) Spizzirri credits IL Sen. Walter Dudcyz for arranging a $600,000 Department of Commerce and Community Affairs (DCCA) grant "to bring this program to the schools of Chicago." Click here for a copy of the grant. (1:20) Spizzirri: "We've trained over 5000 children since October in schools throughout the city. We have an additional one to 43,000 children to train by the end of June." (4:30) Gery Chico indicates he's impressed with her claims. But even that isn't true, according to police and hospital reports and an inquest by the Lake County coroner. The official record states that 18-year-old Christina Spizzirri was legally drunk at the time of the accident; and that after hosting a drinking party while her mother was vacationing in Florida, the teenager got behind the wheel and flipped her own car. Police records show there was no hit-and-run, and even though the local police didn't know emergency first aid, the teenager did not die at the scene as Carol Spizzirri contends. Medical records state that Christina died 30 minutes after arriving at the hospital. (8:30) Former SALF board member Carlos Azcoitia PhD appears. Recently when asked if SALF should be investigated, Dr. Azcoitia, who serves as Chairman of the Board of Trustees for Northeastern Illinois University wrote, " I agree that if there is any suspicion of financial impropriety, it should be investigated thoroughly." Click here for a copy of his e-mail. (9:00) Chico: "I don't think we can afford to do anything but do this (SALF program).